EffectiveSoft and its team of experienced developers, computational linguists and experts specialize in knowledge management and enterprise workflow. We offer our customers Intellexer Summarizer NE, a powerful solution for the task of text summarization. This software product will definitely release you from the necessity of reading. It means that if you have a long article, Summarizer will read it instead of you and give you a short summary within a few seconds. Summarizer supports different formats of documents and successfully summarizes technical and scientific articles, web pages, emails, etc. This software easily analyzes the whole document and extracts the most important facts, conveying the main idea of the source text. 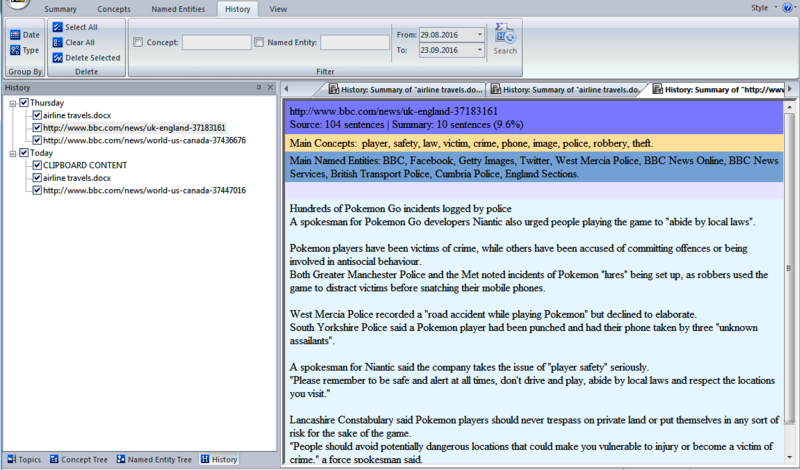 In addition to this, Summarizer NE offers you useful tools for quick document analysis and research. This software preserves main concepts, different names (persons, organizations, locations, etc.) found in the article, and relations between them. We created Summarizer and did our best to present users with this intelligent solution. Being involved in semantic software development and research for more than 15 years, our developers teach computers to understand and analyze the meaning of different text documents. Summarizer NE is an ideal solution for those who don’t have any time or desire to read huge documents. It automatically analyzes a document, a web page, or Clipboard content in English. The result of its work is a short summary that contains the most important ideas of the original text with a minimum loss of meaningful information. Please, note that developers recommend copying the web content to the Clipboard and only then summarizing it in the program. This will ensure more accurate summarization results. The reason is that a web page contains a lot of secondary information like menus, site navigation, ads, article announcements and these can be included into the summary. 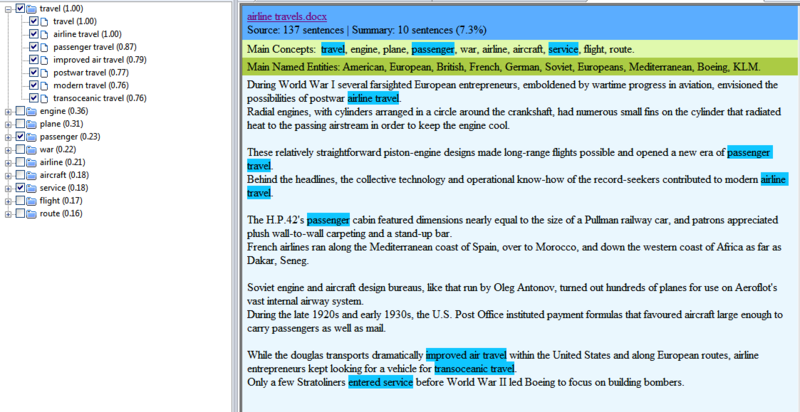 Summarizer NE is able to recognize the type or structure of the original text. It can be a patent, a scientific or news article; otherwise the text structure will be recognised as general. While generating a summary you can also set the size of the text of a summary either in number of sentences or in percent which is a ratio of sentences in the summary to sentences in the original document. Furthermore, apart from generating the text of a summary itself, the user is provided with a possibility to rearrange the summary to his preferences with the help of such tools as Named Entity and Concept trees. These are peculiar features that make Summarizer NE unique software for text summarization. Named Entities Recognition (NER) is very interesting and popular trend that is successfully applied and developed by leading IT giants (IBM Watson™ AlchemyLanguage, Google Cloud Natural Language, Microsoft Cognitive Services). Summarizer NE is a desktop application providing NER, and it is interesting from the point of view of the functionality. Summarizer recognizes 9 types of Named Entities (names of Persons, Organizations, Locations, or Events, as well as Positions, Age, Date, Duration, Nationality). 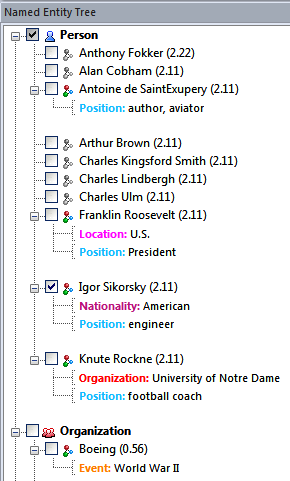 There is also a possibility to set the number of names to be shown in the Named Entity tree, as well as to sort them alphabetically or according to their weight (automatically detected importance of these named entities in the source text). 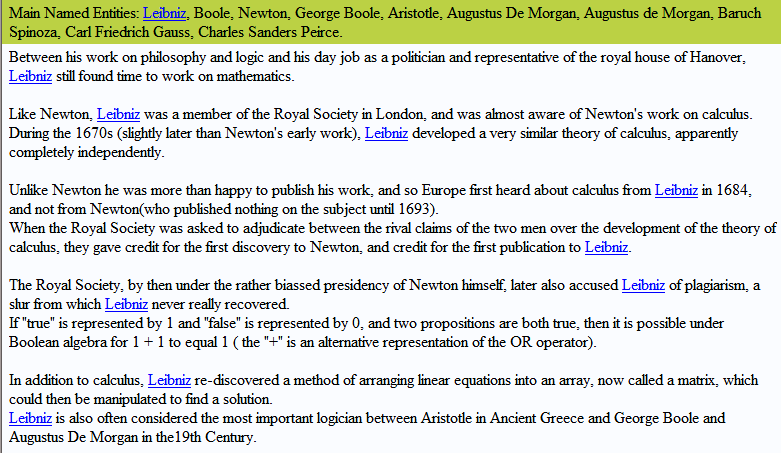 Any name (or names) can be highlighted in the summary by selecting it (or them) in the tree. What is important, the found Names that belong to the same object are linked together and form a kind of a profile. This way, we get an outstanding opportunity to gather relevant information on the subject of interest. Summarizer NE advantageously differs from previous versions and gives an opportunity to rearrange the summary by increasing the value of one or another named entity. If some of the named entities are of specific significance for you and you want to obtain a summary with the emphasis on these entities, you can select them in the tree and rearrange the summary. A concept in Intellexer Summarizer NE represents a relevant term or a phrase, which conveys the main idea or ideas in the source document. According to a number of parameters, such as the occurrence frequency in the text, topic, etc, to each concept a certain relevance weight is assigned. In addition, the concept with a more general meaning may have one or several concepts with more particular meanings. 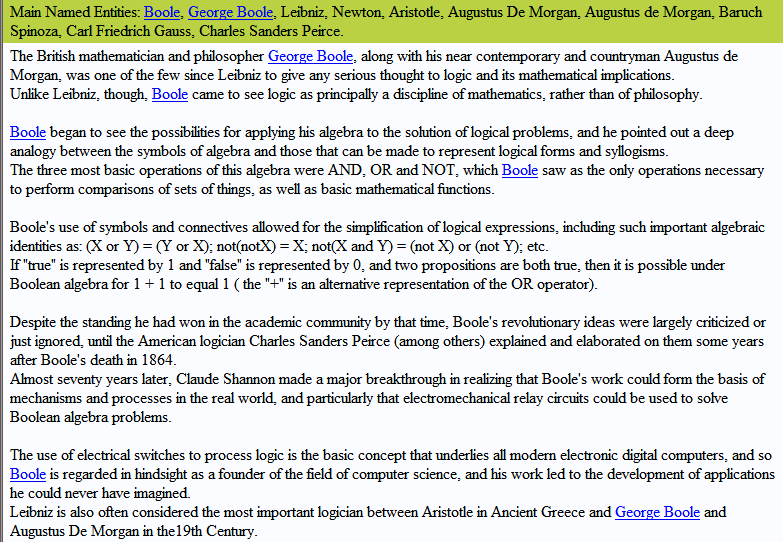 The main ideas of the text in the form of concepts are hierarchically organized and presented in a tree-like form. By choosing certain concepts, you can rearrange your summary with the focus on specific information, highlighting the ideas most important and relevant for you. There are two options at your disposal of how you can sort concepts in the Concept Tree. The concepts (parents) and available dependent concepts (children) within each parent are arranged in alphabetical order or by relevance weight. If you want to see at which places a specific concept appears in the summary, select the concept or a number of concepts in the tree. The concepts will be highlighted in the summary. If some of the concepts are of specific significance for you and you want to obtain a summary with the emphasis on these concepts, you can select the necessary concepts and click Rearrange Summary. Intellexer Summarizer NE generates topic-oriented summaries, thus taking into consideration your specific interests and preferences. With the help of extensive built-in ontologies (e.g., economics, entertainment, environment, health, lifestyle, science, social, sports, tech, transport) Summarizer NE easily and precisely detects the topic of the text. Often a text may cover more than one topic; in this case by choosing a particular one, you can get a summary that covers this topic to a greater extent. Rearranging a summary doesn’t mean you will lose the text of the original one. Summarizer NE has a possibility to save all the summaries once made to History. Moreover, all the summaries are editable, which means you can delete, insert or rewrite some words or sentences in the text of a summary and then save it to History. 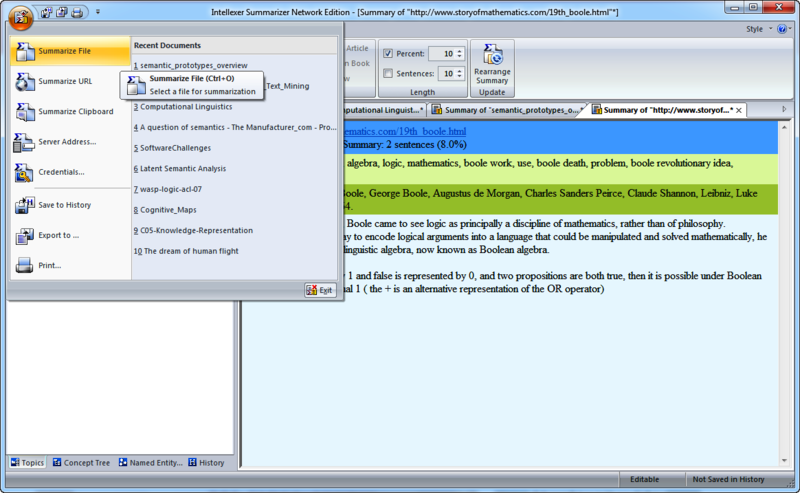 Intellexer Summarizer NE is not only useful but also convenient and easy to operate. Most frequently used commands, such as 'Save to history', 'Export to'(HTML or txt formats), and 'Print' are in plain view, integrated into the Quick Access Toolbar. Moreover, you can use Keyboard Shortcuts to quickly access most frequently used commands. Customization is provided as well. You can easily customize the Quick Access Toolbar by selecting which of the commands to show; add new commands, create or modify shortcuts for each command; decide on how you want the Quick Access Toolbar to be displayed; keep the Ribbon minimized, where only the tabs are shown. There is also a Style Menu which offers a number of color styles to apply to your working environment. 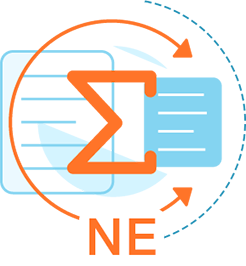 For all the possible issues arising during the work with Summarizer NE use the Help menu which provides access to the Help system and information about the product version. Intellexer Summarizer NE will be very interesting to analysts and researchers. With its help, users don’t have to read long documents but quickly determine whether they need the whole document and if this information is useful. Summarizer generates a short overview of the source document and all important data is presented in the form of Named Entity and Concept tree. You can easily change the summary and get all the necessary information. This software tool will be helpful for both teachers and students, they will benefit from Summarizer functionality and special features. A quick glance at Concept Tree gives you an idea what this document is about. Use 30-day free trial of Summarizer NE to know how Summarizer can solve your tasks.